Machine of Death » Five reasons YOU should submit to Machine of Death today! Five reasons YOU should submit to Machine of Death today! There are about six weeks left until our Volume 2 submissions deadline of July 15. If you haven’t submitted a story yet, here are a few reasons why we think you should consider it! #1 The challenge: Several writers have told us that writing a Machine of Death story was the most fun they’d had with their word processors in a long time. As editors, we know exactly what they mean. 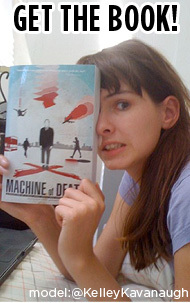 Not only have we personally written more Machine of Death stories than we can print (we can’t help ourselves! ), but we’ve seen dozens of examples of how the apparent limits can yield endless possibilities once those creative juices get flowing. #2 The money: This is about as simple as it gets. It doesn’t cost anything to submit your story or art portfolio. But if you get selected for the book, then you get $200 in cold, hard cash. That’s pretty good! #3 The exposure: The first book has thousands of readers so far (and more every week! ), and is available in bookstores across the U.S. and Canada. Plus many of our contributors got the thrill of seeing their names mentioned in reviews by Strange Horizons, The Onion AV Club, Tor.com, Jeff VanderMeer, and others. Take it from us – this stuff is cool! And though we can’t make any promises, we’re doing everything we can to make the next book even bigger. #4 The opportunities: This is more than just a book to us! We love this idea so much that we take any chance to push it in new directions. This includes the live show that we had last month in Hollywood, as well as slightly more low-key events (both impromptu and planned) at conventions we attend. And we love it when Machine of Death contributors join us for these events. It’s a great chance to meet some real, live fans who think your work is great! #5 The unexpected: We hadn’t even imagined half the stuff on this list when we put out the first book last October. But when the book started selling, we decided to run with it as far as we could go. We’re still running today, and we don’t think we’ve reached the end of the surprises yet. But only time will tell what those surprises will be! Look, at the end of the day, we can’t make any promises about how successful the next book will be, or how many people will read it, or whether it will get turned into a blockbuster movie starring Natalie Portman and Jake Gyllenhaal as hot, young scientists who accidentally change the world. As much as we’d like to, we can’t directly control any of that. But we do know that the next book is going to be awesome and that it’s going to be a lot of fun to be involved with. We’re all incredibly excited to have this opportunity again and we really hope you’ll join us too! So get to work! Comments Off on Five reasons YOU should submit to Machine of Death today!